The electrocardiogram, also called an EKG or ECG, is a test that records electrical activity within the heart. With each heartbeat, an electrical signal is conducted through specialized nerves from the upper to lower chambers of the heart. This causes the heart muscle to contract in a synchronized manner and pump blood throughout the body. These electrical signals are detected by an EKG machine (electrocardiograph) and recorded as a series of squiggles, lines, and waves that correspond to various events associate d with the heartbeat. Unexplained chest pain suggestive of coronary artery disease. Symptoms suggestive of a heart problem, such as shortness of breath, dizziness, or fainting. Screening for heart problems when multiple risk factors, such as hypertension, high cholesterol, cigarette smoking, diabetes, or a family history of early heart disease are present. How is an EKG performed? Performing an EKG generally takes around 10 to 15 minutes and is a painless procedure. Before conducting the test, sticky patches called electrodes are placed on the skin of the chest, arms, and legs. The electrodes are connected via wires to an EKG machine and allow the EKG machine to study the heart's electrical activity from several different perspectives at the same time. While lying at rest, a recording is made on paper and/or saved to a computer by the electrocardiograph. Heart attacks that are in progress or that have occurred in the past. Abnormalities in the way that electrical impulses travel through the heart (e.g. bundle branch block, long QT syndrome, etc.). Since its invention the EKG has been a highly important tool in diagnosing and treating heart disease. Willem Einthoven, credited with inventing the modern EKG machine, was awarded the Nobel Prize in Medicine in 1924 for his discovery. As with other tests used in medicine, however, the EKG is not perfect. There are some significant limitations to its usefulness that will be considered in next week's Health tip. Our sweat glands can produce up to 2-4 Liters of fluid per hour! As the sweat evaporates (turns from a liquid to a gas) energy is dissipated, resulting in cooling of the skin. Our veins dilate and migrate to the skin surface to get closer to the cooler skin. You may have noticed that your face flushes when you exercise, this is partly because of the dilation effect. Arteries and capillaries also supply the sweat glands with blood, and the liquid part of the blood is turned to sweat. 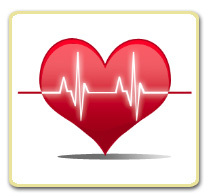 Our heart rate may increase to meet the demand of our sweat glands, and further increases as we become dehydrated. We radiate heat from our body surface, as energy passes from our core to the ambient air around us. When the environment is already humid, our sweat has a hard time evaporating, reducing its cooling efficiency. When the air is particularly dry, our sweat evaporates so quickly that we can become dehydrated if we don't take in enough fluids. Therefore, hot temperatures (along with humidity) can influence our fluid balance, heart rate, and energy dissipation rate at rest. Summer heat is even more impactful when we're trying to exercise - engaging our heat-producing muscles and demanding more of our heart's pumping capacity. How do we experience exercise in the heat? First of all, you'll notice that you fatigue more quickly, and can't reach your usual pace/intensity. Some runners say, "In the heat, I don't compete" as part of an acknowledgement that personal records are rarely made in hot temperatures. If you continue to exercise vigorously, you put yourself at risk for heat cramps, heat exhaustion, severe dehydration and heat stroke. There is an excellent info graphic of heat stroke and dehydration warning signs here. Interestingly, the human body can acclimate and adapt to exercise at higher average temperatures. It will produce more red blood cells to improve the oxygen-carrying capacity of the blood, and become more efficient at sweating, starting to sweat sooner, and creating less salty sweat also. So if you are going to be exercising regularly in hot weather, it may become more comfortable with time. Nevertheless, you will always need to drink a lot of fluid to accomplish your goals. If you have any questions about exercising in the heat, please log into your account and send us your question. We are here to help. I received an interesting question about whether or not a particular diet should be recommended in hot environments. I must confess that because I'm accustomed to air conditioning, I hadn't given it much thought recently. Significant research has been done on the eating habits of military personnel stationed in both very cold and very hot environments, and the findings are worthy of note. Although hot food may raise body temperature, the "thermogenic effect" of food at any temperature is more significant than its physical temperature when consumed. In other words, the body has to work to break down and digest food, and this action creates more heat than the heat of the food itself. One study suggested that certain mammals have a 1 degree increase in body temperature for up to 3 hours after a meal, for example. The bottom line is that our natural tendency is to eat less when it's hot outside, and for most of us that's a perfectly natural and desirable phenomenon. Eating hot food in hot temperatures is rarely dangerous, though we may feel uncomfortable sitting down to a bowl of hot soup in the sweltering heat. As for what's healthy - the same diet recommendations hold year-round. The Mediterranean diet is one of my favorites and has significant research to back its benefits. Food poisoning. 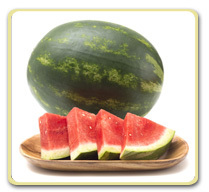 Avoid leaving certain foods out in the heat for too long, lest they succumb to bacterial overgrowth. Summer buffets are a prime risk for food poisoning. The FDA recommends leaving food at room temperature for only 2 hours at a time, and being especially wary of "doggie bags" where saved food may be left unrefrigerated for too long. Hidden calories. It's easy to forget that the fluids we drink can contain a lot of sugar, adding hundreds of unwanted calories to our daily totals. Be sure to fill up with water and low calorie fluids whenever possible. Limit alcohol consumption. Again, when we are thirsty and dry it's easier to take in too much liquid in the form of sugary or alcoholic beverages. Alcohol does have a diuretic effect on the body. For every 200mL of beer, for example, our body produces an extra 120 mL of urine (a total of 320mL) due to complicated hormonal changes in fluid regulation that occur with alcohol consumption. In large quantities alcohol can paradoxically contribute to dehydration and hangovers. When it's very hot outside and you do not have access to air conditioning, limiting/adjusting exercise is probably more important for your health (in avoiding heat stroke) than changing your food intake. In my next tip we'll discuss safe summer sport and exercise strategies. If you have any questions about summer eating, please log into your account and send us your question. We are here to help. Hidden calories. It's easy to forget that the fluids we drink can contain a lot of sugar, adding hundreds of unwanted calories to our daily totals. Be sure to fill up with water and low calorie fluids whenever possible. 4. Limit alcohol consumption. 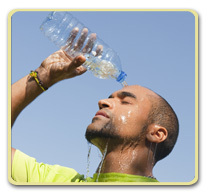 Again, when we are thirsty and dry it's easier to take in too much liquid in the form of sugary or alcoholic beverages. Alcohol does have a diuretic effect on the body. For every 200mL of beer, for example, our body produces an extra 120 mL of urine (a total of 320mL) due to complicated hormonal changes in fluid regulation that occur with alcohol consumption. In large quantities alcohol can paradoxically contribute to dehydration and hangovers. If you're interested in minimizing facial wrinkles, limiting "age spots" and discolorations, and avoiding skin cancer, then you must take steps to protect yourself from the sun's ultraviolet (UV) radiation. After a long, dark winter, we all yearn to shed the sweatpants and sweaters and get outside into the sunshine. Just remember to protect your skin from harmful rays prior to dashing outdoors. It's important to do this consistently. Getting a sunburn (defined as pinkness or redness from sun exposure - it doesn't have to blister or peel to qualify), just once every 2 years, can triple your risk of melanoma skin cancer. And for those who are already using skin-lightening creams (hydroquinone) to reduce prior sun damage, an entire month of cream application can be reversed in a single 15 minute, unprotected sun exposure. Avoid direct sun exposure when the UV rays are their most intense (10am-4pm). Choose to sit in shaded areas whenever possible. Wear sun-protective clothing. 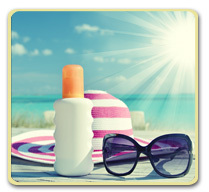 Some summer clothing manufacturers list the SPF (sun protection factor) on the label. Coolibar (https://www.coolibar.com/mission/fabric-innovation) and REI (https://www.rei.com/s/sun-protection-clothing) are two companies that feature sun-protective fabrics, for example. Wear sunglasses with UV protective lenses and a wide-brimmed hat. Use high SPF, broad-spectrum sunscreens (>30 SPF). There are two kinds of sunscreens - chemical (which use a scattering mechanism to reduce UV exposure - benzophenone and octinoxate) and physical barriers (sun blocks, which usually contain one of two metals: zinc oxide or titanium dioxide, do not allow the rays to penetrate). Whenever possible, choose the block type of sun screen as it is more effective. These days there are many tinted block options that reduce the old fashioned "white lifeguard nose" appearance. Remember that the sun reflects off of water and snow, and UV rays are stronger at higher altitudes. Reflected rays can actually burn you under your chin, so don't forget to put sunscreen there. Re-apply your sun block every two hours or when you suspect that water or sweat may have removed them or reduced their efficacy. Remember to cover your scalp and ears - visors do not provide the kind of coverage that full hats can. Use sunblock on the ears if they remain uncovered. Ear skin is high risk for skin cancers because we often neglect to put sunscreen on them. Besides sun damage, dehydration and heat stroke are concerns at high temperatures. For more information about these topics, please refer to my previous health tips about water intake and heat stroke. I'll see you around in my white, SPF 50 turtleneck with a big hat and sunglasses and zinc-face this summer! If you have any questions about summer skincare, please log into your account and send us your question. We are here to help.